Couple an potentiostat with a spectrometer can be a powerful tool in order to examine electrochemical processes. 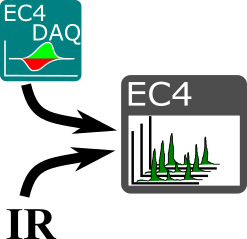 The two instruments create different kinds of data sets with different sampling rates. As a results, in order to plot the two data sets together they must first be synchronized and re-sampled. 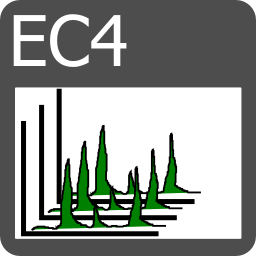 EC4™Spectra software simplifies this process so that only a few mouse clicks are needed. 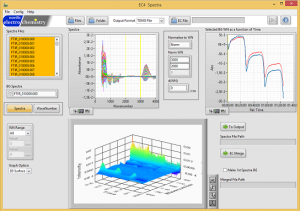 *.TDMS – from National Instruments. For further information, please contact us at Nordic Electrochemistry. Origin® is registered trademark of OriginLab Corporation. 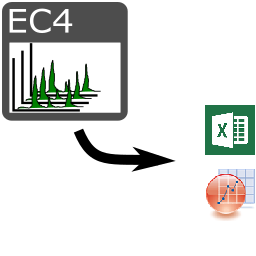 Excel® is is registered trademark of Microsoft Corp.